Sunday Photo; the path to GwanEum Temple – Wake Up and Laugh! I didn’t think to count them at the time, but from what I was able to make out from another photo, if there aren’t 108 Buddhas here, it’s really close to it! Each Mireuk Buddha has been carved with slightly different features and there are several different mudrā among them. Once you pass through the small shrine of the Four Heavenly Guardians, there are another two rows of much larger than life Mireuk Buddhas, each sitting on a column of piled stones. 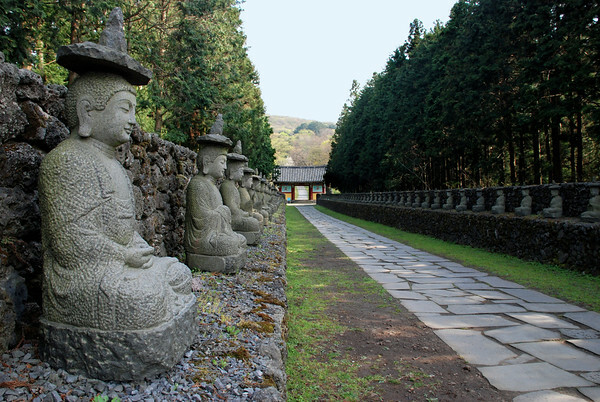 There are more Buddhas across the grounds of this temple than most other temples combined! Kinda like walking down Main Street in any big city – Buddhas everywhere! Thanks for the nice point of view! Lovely! Thank you for this photo today! Hmmm… this 108 thang shows up everywhere! Strange, eh?